RapidSOS’ Haven app is now available for download on Apple and Android mobile devices, showcasing impressive innovation that enables faster, more accurate, and more informed response services in emergencies. The app is available for free download for a limited time only, after which time monthly subscription costs will be $2.99 for an individual and $4.99 for a family. Fee waivers are available. Haven leverages the many capabilities of a smartphone – including GPS location, calling, texting, and data storage – and seamlessly integrates them with existing 911 infrastructure. With Haven, app users can now call or text for emergency help, and call centers in the contiguous United States can receive GPS location, allowing them to dispatch first responders more accurately and therefore more rapidly. Emergency service infrastructure has lagged behind in the mass technological innovation of the past few decades. Unlike taxi apps such as Uber, 911 services continued to largely rely on infrastructure from the 1960s when landlines, not smartphones, placed emergency calls (hear comedian John Oliver on 911’s outdated tech here). This is a welcome improvement, and one that could help people with diabetes in emergencies. Data shows Haven saves an average of 1-5 minutes in response time per emergency call/text placed. As MIT Professor Scott Stern’s research shows, minutes saved translates directly into lives and dollars: per minute saved in emergency response time, chances of survival increase by more than 2% and hospital bills fall by nearly 7%. The RapidSOS team is working on wearables integration that will allow caregivers who receive medical device data – like CGM data – to dial 911 on a loved one’s behalf (e.g., if a parent receives an alert that their child in a different location is in acute hypoglycemia and is unresponsive). The call will be connected to the appropriate dispatch center with automatic transmission of precise location and medical information. Pre-loaded health information can be stored in the app, allowing 911 call takers to access critical health information in seconds. 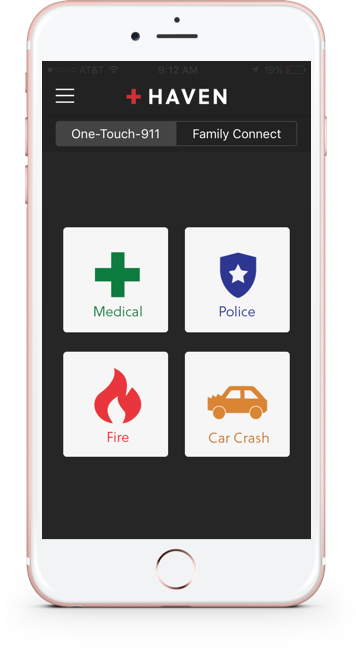 The Family Connect feature lets multiple mobile devices share location information and call for emergency help on behalf of someone else if an emergency is suspected and a response is not received. RapidSOS engineers are also working to develop techniques that will analyze data to predict – and hopefully, prevent – emergencies before they happen. RapidSOS formed a partnership with two diabetes organizations, College Diabetes Network and carbDM, to continually gather and incorporate feedback about Haven’s functioning and usability from the diabetes community. The anticipated predictive analytics feature, when it is launched, offers promise for people with diabetes, hopefully curbing dangerous lows before they can occur. Haven can also expand access to emergency services. Situations where a caller may be placed in danger by speaking out loud or where a location is not known or easily communicated are especially well addressed by the product’s expanded capabilities. The Town of Cambridge, MA, is the first city to partner with RapidSOS to provide all of its citizens with a decade-long subscription to Haven. For more, check out RapidSOS FAQs and download the app for you and your family (fee waivers are available if necessary).